For in a Discourse of our present civill warre, what could seem more impertinent, than to ask (as one did) what was the value of a Roman Penny? Yet the Cohaerence to me was manifest enough. For the Thought of the warre, introduced the Thought of the delivering up the King to his Enemies; The Thought of that, brought in the Thought of the delivering up of Christ; and that again the Thought of the 30 pence, which was the price of that treason: and thence easily followed that malicious question; and all this in a moment of time; for Thought is quick. From Leviathan, by Thomas Hobbes of Malmesbury while considering the idea of 'a Trayne of Thought Unguided'. What should one take from this paragraph? That Hobbes was a monarchist for religious reasons or not? I thought it would be fun to show you my latest very short film - shorter even than Tim's 5 minute Bible. (It's not Dr Who nor is it Nadal and Djokovic playing tennis on a boat in Patagonia). Just a brief on the new slide for my next class in the Psalms at St Barnabas next Tuesday. One day I will republish the original session 3, but it takes the computer a long time and I will probably change it again. Full presentations for the course are here. 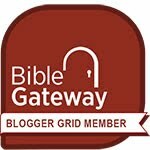 Violence in the Psalms? What about the NT? What about consequences today for ill-behaviour? Yes there are consequences. We are not into cheap grace or dissembling as are certain prominent persons in my country at present, whether they admit it or not. Here is a review of a suggestion in a book by David Neville, A Peaceable Hope: Contesting Violent Eschatology in New Testament Narratives, that we quarantine the violence of the NT. Read the argument there. I have a simple conclusion: if we are to be like Jesus, then as in the psalms, there is no warrant in the text to take violence into our own hands. That question, so obvious, has been bothering me for 2 days now. Why should we read, study, or sing the psalms in liturgy when they are so violent? How do I justify reading them when I cannot and will not justify violence? Yet we know we not only live in a violent world, but we live among violent people in societies that have laws maintained by violence. For now I will just give a brief answer on how the psalms help me adjust and manage in a violent world among violent people. If you find my translation strange, check out other interpretations (yes translation is interpretation). How does God wear our heat? One way is his presence with us in our prayer. David prays to be defended from violent persons (Psalm 140). The psalms address violence throughout. The violent prayers of Psalm 55 anticipate a series of psalms (57-59) which are not popular with 20th and 21st century church service organizers. These psalms (with Psalm 75) are entitled: Do Not Destroy. Perhaps it is instruction concerning the music. But the preparation for their violence is already here in this psalm justly made famous by Felix Mendelssohn in the verse anthem Hear my Prayer. It is not difficult to find the rationale for the inclusion of violence in the Psalter. It is a recognition of the reality of violence and fraud in the city, and failure of governance, things that are not foreign to our time. This is the reality in which the elect prays. I also made a footnote (p 190) of the work of Rabbi Rachel Barenblatt about Do Not Destroy: We need to be reminded not to destroy these psalms. They reflect reality. Psalm 72 continues the hope for delivery from violence. Solomon was not successful in fulfilling it. Psalms 73 and 74 begin the book that recalls the greatest violence to Israel, the destruction of the city and of the temple. We recently heard again the Dixit Dominus of Handel. Here's another direct answer to the question of violence. It is in the second to last verse and the intimation of resurrection in the lifting up of the head after imbibing of the torrent of human destruction. Psalm 110 has been among my favorites ever since I first sang Dixit Dominus by G. F. Handel. Handel’s setting is fierce and challenging youthful work, almost unsingable, and full of word painting and extreme of emotion. How do I translate ferocity into love? How do I prevent war mongering based on Scriptural justification? How do I challenge superiority and privilege justified by the divine right of kings? How do I understand the priestly and royal anointing without succumbing to the tyranny of too much power in the hands of one individual? I don’t know that I can find short answers to these questions. I do want, however, in interpreting this poem, to move away from violent overthrow to adoration, and an adoration that is not constrained but nourished by an abundance of joy from the knowledge of the torrent in the way. I want to find structural clues in the double use of the word מָחַץ (mxc) meaning wound used about 14 times in the Tanakh. Lessons learned are not passed from one to another in a few words. If words are useful, their reception into the body is an insemination that undermines the commonplace and in the mysterious working of the life of a human, gives uneasy birth to a new thing in the world. To what extent did the ancients of the first century reframe the violence of their tradition? If I pray for sudden shame on my enemies, I think it is only by the reality of shame that we can see the righteousness of God. So for God to destroy the wicked does not mean there is no follow-up. As one of his spokesmen said, he wounds, he makes alive. Much as I hate to agree with a Job’s comforter, Eliphaz (Job 5:18), he is only alluding to God’s word in the Torah, Deuteronomy 32:39. I think that death and resurrection are the subject of Psalm 110. God himself drinks of the torrent in the way, a torrent of death by which he wounds, and a torrent of life by which he raises up the head he has smitten (compare Psalm 3) and all of us in that head. In this way, violence is transformed into adoration by the one who tasted death for us, the king of righteousness and the high priest. This psalm gives the writer of Revelation permission to construct a theology of violence that is purely a meditation on the wounding of the Anointed, High Priest, King, and Lambkin. There is no further mention of violence after Psalm 110 until the recapitulating prayers of David beginning at Psalm 140. The Psalms encapsulate the quote from Neale and Littledale that is at the top of this post. They are the canonical story, a measuring rod, of what all nations are like. Israel's history is given as example. All nations are like them in their desire (Psalm 90 / 102) and in their failures (Psalm 89). Psalm 2 highlights the enemy of the sovereigns of the earth (and that includes us all). Psalm 149 shows the submission of the same sovereigns to the rule of steadfast-love or loving-kindness. The bonds of love are stronger than death. It doesn't matter how well prepared you are, there are always unexpected things. My eyes are fading so I could hardly see the screen in the light in the church - curious - and slightly ironic. But we got through. In sessions 1 and 2, I have made all the text on the slides bigger as far as I could. I dropped the slide on Psalm 11 - it's in the book and can be studied individually. But most important - the first exercise is quite hard so I have simplified it. (Revised video here). There is no change in the voice over. Sometimes I wonder about the thesis that word patterns are deliberate. I still think they are. It is poetry after all, but in performance, it is hard to tell, sometimes. What is most curious to me is the complex aspect of putting an idea across to others - and then waiting for the consequences and questions and group formation that can happen as a result. Time will tell. First, I will be making sure I can read the slides in lectures 2 to 6 and secondly, that the workshop exercises are not too open ended. Augh! Session 2's workshop could take hours! I have simplified it. The slides for the whole are here - sessions 1 and 2 are revised. Now - the puzzle problem is this - suppose we see clearly what is in the Psalms - what then do we do about it? How do they help us today? Why is there so much violence? I suggested a direction of consideration - but I deflected the direct question partly because I think the understanding must arise from within the community - fully facing the text and its implications - not sanitizing it. My book does suggests possible approaches to such questions - but the main task of the book is lay out the poetry for study and I think it accomplishes this. 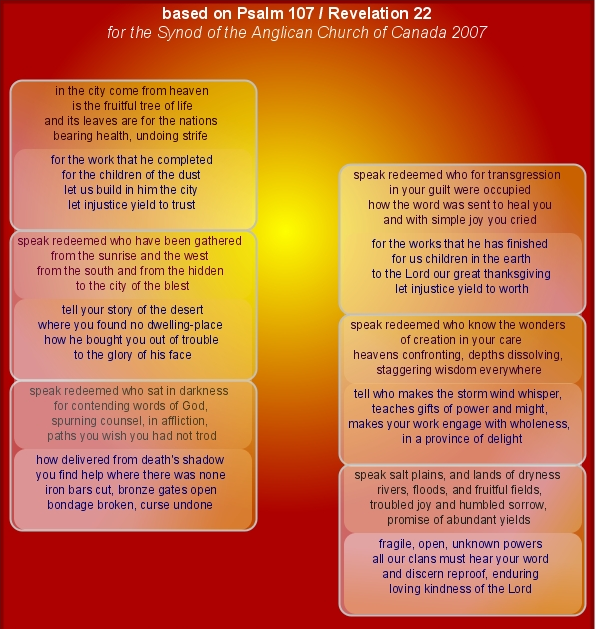 Here's a poem I wrote 6 years ago based on Psalm 107 - I had completely forgotten of course. No I haven't but I have listened to a few good lectures. This one by Tom Wright on the Psalms is worth the hour. This one by Rabbi Jonathan Sacks on covenant is equally good - could take two passes at it. Covenant is the redemption of solitude. I also listened to Geza Vermes on the Dead Sea Scrolls. Rabbi Rachel wrote beautifully on questions here. I have been reading other blogs remote and local like Christopher Page on memory - Kristallnacht and Remembrance Day. And James McGrath on the end of Job and The Aces on Bridge, my regular bridge column. They add well - and look at the last verse - did you ever note the mitsvah of Jesus? Teach is among his commandments. But the students are his. And I am thinking about writing. I would like to work through the psalms where Jesus does the reading, a theological exercise in prosopopoeia. (Funny word, eh?) It's short for making a face. It has been a while since I used the AMA GX-LEAF Diagramming tool as a diagram surface. I have been using it in so many ways as a means of creating web forms. It is still a fabulous diagramming surface. I have been thinking for months about the Psalter as a tent which one inhabits as one might inhabit poetry - metaphorically(!) A tent doesn't need one gate though Psalms 1 and 2 provide one. One can always slip under the canvas - or perhaps it is open all round. But a tent does require some tent poles and a few high wires. 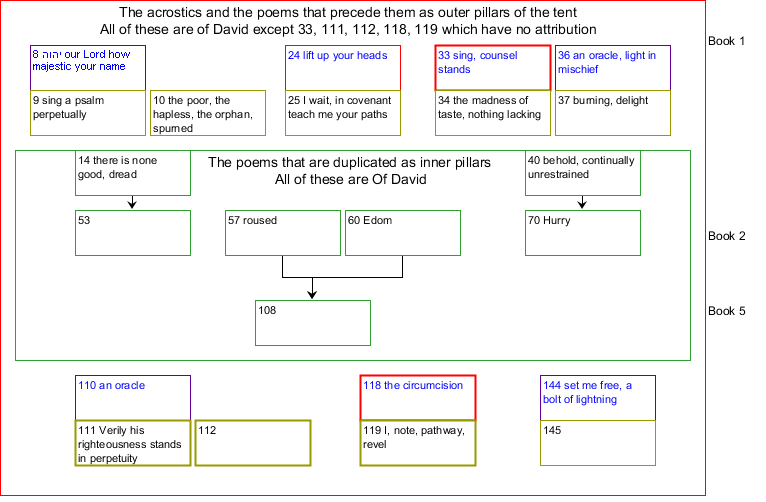 There are such poles - two sets in fact: the 8 acrostics (9 poems - one got ripped in half) and the poems that immediately precede the acrostics - 7 of them (figure out how only 7 precede 9 poems). And secondly, the duplicated poems. Notice that none of these poems is attributed to Korah or Asaph. They are all 'of David' or unattributed. I was asking today about reconciliation between Jew and Christian. My own hesitant question is here. On the way, another blog took on the question - did Jesus learn. And in that question - answered directly in Hebrews 5:8, the Hebrew translation reconciles Jew and Christian equally directly. Here, it is Christian who needs to do the mitsvah - to hear the voice of command. A Christian who is without hearing needs a different name. All of us in our various lives (and in my multifarious levels of blindness and deafness) must find obedience. Such obedience never leads to violence because our violence is fully disclosed to God (see Psalms 58, 109, and 137 for examples). but even though he was son, he learned (same word as Talmud) through his bearing of burdens to hear the voice of command. though being son he learned from what he suffered obedience. So that Hebrew, usually compact, takes three words to say one Greek word.